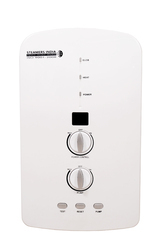 Steamers India Instant electric water heater suits for house and hotel bathroom use. It has automatic memory function to avoid repeated operation. Substantially reduces risk of Hot Water Burning injuries to children and elderly. Warranty:12 months warranty from the date after received our electric water heater. Our Services:Your inquiry related to our products or prices will be replied in 12 hours. 01). Red copper straight flow heating system gets the water heated in 3 seconds;02). Particular "anti-scald" technology, no hot water left to prevent scaling;03). 3D heating system with no heat loss, tekes less power(300-600W) than other similar products;04). Anti-creeping chip, with the input and output electric guard devices;05). Dry heating protection, over temperature protection; when water flow rate is lower than theminimum operating volume, the water heater will stop heating to avoid dry burning and damages to the heater.06). The temperature controlled by CPU, much more stable ;07). Constant temperature mode and manual temperature ajustment mode,two ways to choose;08). Enclosed type with the external decompression valve;09). Exclusive invisible LED displays water temperature, simple panel design;10). Multi-functional Knobbed switch design, easy to control;11). 3 seconds to get water heated , Energy saving and endless water supply12). Use Germany Nickel-Chromium heater technology, thermal efficiency up to 99%13). We can provide the best after-sales service for customers, try to meet their requirements.